Pike-Pine Corridor - A Walker's Paradise. The Pike-Pine Corridor might be described as a narrow, quirky slice of everything that makes life fun. This area stretches from 12th Avenue to Interstate 5, completely encircling Pike and Pine Streets. The corridor connects the waterfront to the Washington State Convention Center, Pike Place Market, and the Retail Core. 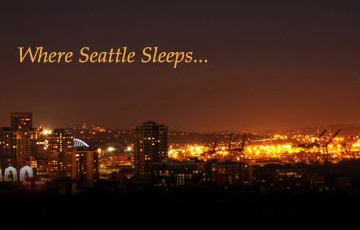 It is close to Melrose Market, Downtown Seattle, South Lake Union, and Belltown. The area features a medley of shops, boutiques, galleries, bakeries, restaurants, bars, studios, and cocktail lounges, many of which sit below reclaimed loft condominiums fetching a hefty price. Demand for real estate in the Pike-Pine corridor far exceeds the available inventory, creating the perfect condition for quick turnaround. Low-rise buildings interspersed with multi-storied dwellings provide a surprising backdrop for a transportation corridor filled with pedestrians, bicycles, and buses. Preserving a bit of the town's original architecture, the OddFellows Building is home to the Century Ballroom. The Egyptian Movie Theater is housed in what used to be a Masonic Temple. 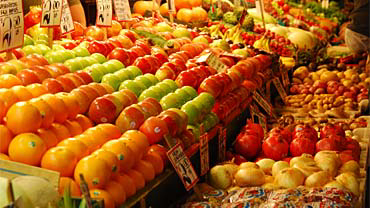 Seattle's original farmers' market (1907), Pike Place Market bustles with the sale of fresh produce, flowers, bakery goods, and a unique assortment of merchandise. The Pike Place Fish Market employs a crew of individuals who toss fish daily just to entertain customers. 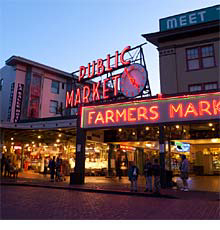 Since its opening in Seattle's Pike Place Market in 1971, the original Starbucks is always filled with curiosity seekers and coffee lovers who follow the delectable aroma wafting along the streets. Linking downtown Seattle with Capitol Hill, the Pike-Pine corridor was named as one of the top twelve "ArtPlaces" in America in 2013. The fountain and reflecting pool at Cal Anderson Park provide a relaxing respite from the hustle of going from one shop to another. The Ferris Wheel at the Pike is lit up at night and offers panoramic views of the entire harbor area.